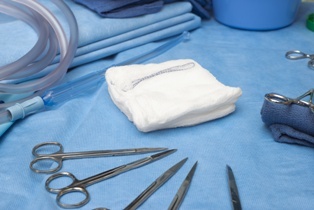 Most of us understand that surgical procedures carry some degree of risk, however, leaving a surgical sponge or instrument inside a patient is not acceptable. It is medical negligence to do so. This is considered a never event in the medical community, which means it should not happen when standard protocols are being followed. If you have been a victim of such a medical mistake involving a retained sponge or instrument, you are most likely entitled to malpractice compensation. When you go to the hospital for a surgical procedure, the surgeon can be expected to use up to 250 different surgical instruments, tools and sponges. Without careful tracking, these items can inadvertently be left inside the body. Surgical sponges are the most common items left inside the body because they are very small and hard to see with the naked eye after they have been used to soak up blood. Hospitals continue to develop new ways to reduce the risk of leaving behind sponges and instrument, such as using radio frequency tagged sponges and towels or requiring postoperative x-rays to verify that no sponges or tools remain in a patient. However, there are still thousands of incidents that happen each year in hospitals across the United States. Studies have shown that emergency surgeries or those that encounter unexpected complications are most likely to result in retained surgical sponges, but this type of error can happen in any operation. Infection from bacteria buildup on the sponge, which can be life-threatening if the patient does not receive antibiotics promptly. Complications from infection, such as infertility from a surgical sponge left near the reproductive organs. Complications from the sponge becoming tangled or attached to internal organs, such as needing to have part of the intestine removed. The need for additional surgery to have the sponge removed, which results in additional recovery time and the risk of surgical complications. Internal bleeding or other injuries, if the sponge accompanied a sharp object such as a safety pin or knife blade. The risk of severe harm increases as time passes. Although most cases of retained surgical sponges are discovered fairly early, there have been cases of patients going years with vague symptoms of pain and discomfort before they realize what has happened. To have a valid malpractice case, you must establish four elements: duty, breach of duty, damages, and causation. Duty: The surgeon and his team owed you a duty of care while being treated as a patient. Breach of duty: The surgeon failed to provide care that was in accordance with accepted medical standards for that specialty. Damages: You suffered damages, such as infection or needing a second surgery to remove the sponge. Causation: The surgeon's breach of duty caused damages. Since retained surgical sponges are considered never events, proving negligence is generally easier than in other types of malpractice cases. Sponges do not get left inside the body unless someone has had a surgical procedure. Medical expenses, including future medical care if complications of the retained sponge or instrument have created a permanent disability. Lost wages, including loss of future earnings if you are no longer able to work full-time due to your condition. Pain and suffering, including both the physical pain and emotional trauma from the experience. Hospitals are often well insured with teams of lawyers working to protect their interests. Retaining the services of an experienced medical malpractice attorney can help ensure that you have someone available to advocate for your rights to a proper settlement that adequately meets your future financial needs related to the incident. The dedicated legal team at Inland Empire Law Group helps Southern California residents receive the compensation they deserve after being harmed by a healthcare provider's negligence. Call (888) 694-3529 today to schedule a free, no-obligation consultation.